For 100 years now, the RAF's courage, perseverance and innovation has secured freedom, survival and safety for the many - at home and abroad. Since its infancy, the RAF has demonstrated the power behind its original mission: to embody an agile, adaptable, capable air force. Created in 1918, the RAF has continued to develop radically, responding to the demands put upon it and embracing burgeoning new technologies. The men and women of the Royal Air Force take pride in their training and duty. With efficiency, determination and courage they enter theatres of war, defend freedom and bring relief to people in need. The RAF is steadfast, always ready for action. It remains the agile, adaptable, and capable air force it set out to be 100 years ago Looking to the future, "through adversity to the stars". 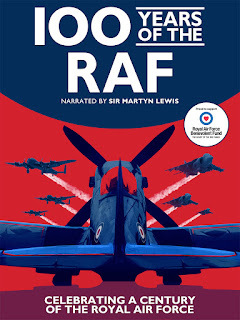 Including extraordinary, unseen historical footage of both World Wars and narrated by Sir Martyn Lewis, 100 Years of the RAF is a definitive film that pays tribute to the determination and courage our men and women take on in the theatres of war; to defend our freedom and bring relief to people in need. Produced and Directed for Forces TV by Andromedia and in association with Octopus TV. 100 Years of the RAF is produced by Richard Jukes of Andromedia with Richard Jones of Forces TV.